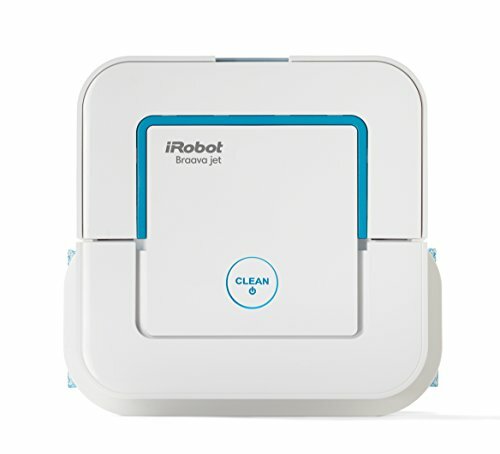 (Last Updated On: November 13, 2018) Braava jet 240 is the latest intelligent cleaning robot from iRobot. This model will wash tiles, parquet or marble in our home. Special operating modes include wet mopping, wet wiping and dry sweeping. iRobot has created a device that will facilitate cleaning the flat for people who prefer elegant floors instead of rugs. Thanks to automation and compact dimensions, taking care of the floor takes place without our participation, and the device reaches autonomously even in hard-to-reach places. Precision sprayer moistens the floor in front of the robot. The vibrating cleaning head then softens dirt and stains. At the end, Braava jet pads collect dirt. During the work, iRobot Braava jet 240 creates a cleaning plan based on the layout of the flat. Thanks to navigation, it reaches hard to reach places. It will wash the floor in the kitchen, bathroom, including under and around the toilet, at the corners and walls. The robot automatically selects the appropriate cleaning method based on the overlay it uses. After finishing work, you do not have to get your hands dirty. Just press one button to release the cleaning pad. Exactly this model of the device will be tested soon on our websites!